Over 35,000 installations world wide! GUARANTEED 15%+ Annual Energy Savings, or a 24 month or Less R.O.I. Savastat LC - Energy Saving Boiler Controls Significantly Reduces Unnecessary Boiler Cycling! Savastat LC works with existing boiler controls to help reduce the energy used for space heating or process hot water loop systems by up to 25% or more annually. (WE GUARANTEE A MINIMUM 15% SAVINGS) Savastat LC is easily installed on existing boilers with a minimum amount of downtime. (allow about 15 minutes of down-time, and an hour to commission) Applications for the Savastat LC unit are for low pressure non-modulating HW Loop System boilers only. 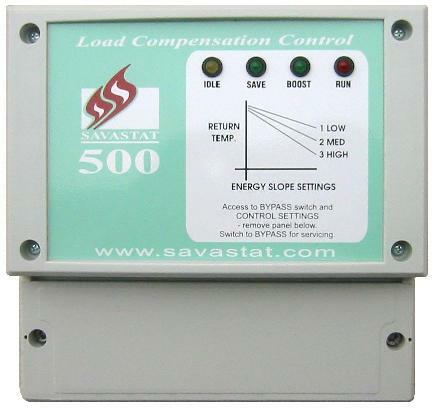 Savastat LC units can be adjusted for 24v, 110v, or 220v boiler thermostat operating voltages. How can we ALWAYS GUARANTEE a minimum 15% annual energy savings with Savastat LC on space-heat systems? Professional Heating & Plumbing Installer Two Time Winner! Savastat LC employs an additional level of intelligence to hot water heat boiler system controls. By monitoring the return water temperature and rate of temperature decay (return temp. at the boiler) it can determine the load on the system. This allows for small adjustments to be made in mean system temperature, that often accumulate to savings in excess of 20% reduction in fuel consumption and associated costs. Microprocessors have revolutionized control systems in recent years. The Savastat LC processor samples the system twice per second, so it is working in 'real time' to compute savings potentials. It doesn't use historic data to try to 'out think' the system and predict what might happen. As we all know, weather changes can be dramatic and short term, often fooling devices that try to predict system demands. Reduce energy consumption by 15% or more or provide an ROI of 24 months or less. Guaranteed. system by reducing boiler short-cycling. Install easily with minimal required downtime. Savastat LC works under the principles of Load Compensation. When a boiler (or boilers) is at maximum demand (early morning start up, for example), Savastat will take no action because there will be no opportunity to make a saving. At any other time when a full load condition does not exist (when the space/room temperature is nearing its set point of 66 - 70 degrees F, for example), Savastat will make savings by adjusting the boiler operating temperature in relation to these reduced load conditions. Savastat achieves this savings by measuring the RATE OF TEMPERATURE LOSS of the return water to the boiler and applying a level of intelligence to the boiler thermostat to prevent the boiler from firing wastefully. Status lights on the unit confirm when savings are being made. This action does not affect comfort levels because Savastat will never prevent hot water from being delivered to the radiators or other heat emitters. Savastat LC is an appropriate upgrade on all traditional low water temperature boilers using radiators and heat exchanger space heating, except for those implementing modulating control systems. Some hot water loop process boiler systems are compatible as well. Check with your Savastat Representative for details concerning non space-heat applications, and to determine if Savastat LC may help your organization lower operating costs. Savastat LC status lights indicate which mode the device is currently in. If none of the status lights are illuminated there is no 'call for heat' by the boiler thermostat, this means the boiler thermostat circuit is open and the boiler’s burner is off. IDLE: When the boiler thermostat initially calls for heat, the yellow idle light is illuminated for a 30 second delay while Savastat LC computes what action to take next. Savastat is analyzing the system status in “real time” to determine if heat is needed to be put into the system, or savings can be achieved by holding the burner off. SAVE: When only one green save light is illuminated it indicates that Savastat LC has entered a save mode preventing the boiler from firing while the computation involved is looking at how fast the return water temperature is dropping away from the set reference temperature. BOOST: When both the save light and the boost light are illuminated Savastat LC has entered a save mode while the computation involved is looking at how fast the return water temperature is dropping towards the set reference temperature. RUN: The red run light will be illuminated when Savastat LC has finished its active mode and allows the boiler to fire. When the boiler finishes its burn, this light will go out and the cycle will repeat the next time the boiler gets a ‘call for heat’, and is asked to burn. If you are considering upgrading your boiler control systems to modulating equipment, BE SURE TO CONSIDER THE SAVASTAT LC UNIT FIRST! The cost differential between the modulating equipment and the Savastat LC is enormous, and the payoff for the LC unit is often well under 12 months! Savastat LC eTrac LC Test Port Adapter - an ECMI Exclusive! All Savastat LC units provided by ECMI come standard with our EXCLUSIVE test port adapter wired into the Savastat LC connector leads. This allows simple integration of the eTracLogic eTrac-LC test device for energy auditing purposes. The eTrac-LC allows us to run a comprehensive energy analysis on the boiler to determine EXACTLY what savings are being achieved by the Savastat LC unit at your facility. See eTracLogic Systems eTrac-LC information pages for further details about how this device works to show our client their actual savings. Also contact us about our Savastat LC Test Drive Program to see how we work with our clients to show the actual benefits being achieved with Savastat LC. We have contacted the DOE Energy Star Program regarding our Savastat LC unit, and the possibility of inclusion of the unit in the Energy Star Program. Because Savastat LC does not currently fall within the categories developed by this program, we are unable to qualify the product at this time. Also, because our Savastat LC controller is considered a sub-component of an overall system, program approval would require packaging our Savastat LC unit with a specific boiler system to test and confirm specific energy savings with the overall system. Progress is being made in this area regarding OEM application of Savastat LC with various boiler manufacturers. Updates to follow as developments occur. If your company is a boiler manufacturer and would like to look into offering Savastat LC as an OEM option, please contact ECMI Headquarters.